The end of the year is a good time to look back and not only reflect on how I have served others this year, but to make a plan for the coming year. The verse above tells us that as faithful workers for God, serving is our responsibility …. but how seriously do we actually take it? My “Prevent Diabetes” class has taught me that I can accomplish more than I thought when I have a clear goal and a plan. Our plan for service should include using the specific, individual gifts which God has given. I can’t do everything, so I need to concentrate on those things that I do best. I don’t have the answers yet, because this thought has just now occurred to me. It’s something I’ll be praying about, and I’m hoping this post will encourage others to do the same. Look for more on this topic in January as I wrestle with myself and God. One thing that will definitely be on my list is this blog, which uses both my passion for writing, and (hopefully) my spiritual gifts of wisdom and encouragement. Have we served you this year, readers? I’d love to hear some responses. We all know the verse (Psalm 23). Over and over again God compares himself to a shepherd to give us a picture of how He loves us. Yet we learn early on in the bible that this profession is not highly thought of. This was before Moses, before the long documented rivalry (sometimes brotherhood) of the two nations. This was before Israel was even a nation. So why did they refuse to eat with them? Hebrews were shepherds. There’s that word ‘detestable’ again. Why did the Egyptians think it was so bad? Lots of people have opinions on this, and not many agree on why. I think the Egyptians were simply grossed out. Anyone on a ranch or farm knows that tending to animals is dirty, smelly, laborious work. Joseph’s brothers probably smelled a bit. Think about it. Sweat, animal poo, the lack of indoor plumbing at thier disposal. So knowing how Egyptians felt, Joseph wisely advises his family to tell the Pharaoh what they do for a living. And they are allowed to settle in a fertile land separately and quietly. God knows we sheep are a lot of work. Still he meets us where we are. Smelly and unclean, and he takes us by still waters to freshen us up. Thank you God for serving in a less than glamorous way. And forgive us when we think we we’re above any similar task. Amen. In a recent sermon my husband spoke about his childhood. Now and then he and his oldest brother and sister would become so unruly and disobedient that his mother, in frustration, would go into the pantry, sit on a lard can and cry. For the kids, this was the worst punishment ever. They had made their mom, the person they loved more than anybody or anything in the world, so unhappy that she cried. What pain and remorse they felt! Not because they expected to be punished, but because they cared deeply for their mother and never wanted her to be disappointed in them. This story tells us something about what our motive for serving should be. When we are selfish and disobedient, it hurts God; God, our Father in Heaven who loved us so much that he sent Jesus to die on the cross for our sins; God who provides for us every day of our lives; God who has mercy and compassion on us, even when we turn away from Him and forget Him. Children don’t serve and obey their parents out of fear, or even because they may gain a reward. They serve their parents out of love and gratitude for who they are and what they have done for the family. God made us His children; He loves us; He takes care of us. Don’t disappoint Him. Serve like a son! 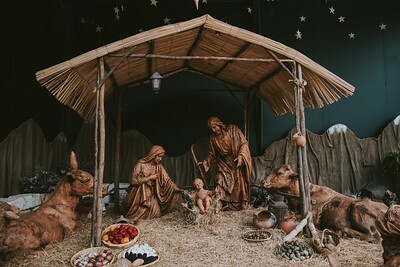 The sermon at the Christmas Eve service at St. Paul’s was entitled, “Jesus Got Dirty.” The Son of God was born, not in a sterile hospital room, but a stable, filled with animal smells and rotting straw. He was welcomed by sweaty, travel-worn, unwashed people. Think about it …. if a feeding trough was the cleanest place to lay a newborn, what were the rest of the surroundings like? Jesus, the purest person ever, was willing to get dirty to serve us. Why? Well, there was no other choice. Justice had to be satisfied, and it had to be satisfied by a human being. So Jesus came down into our mess in order to redeem our lives. This should tell us something important about service. If we’re to be servants, there are plenty of times when we’ll get dirty. Sometimes the dirt will just be the everyday grime of life — cleaning up the garage, washing the feet of the elderly, changing babies and cooking meals. Other times, we’ll find ourselves dealing with the mud created by sinful behavior, selfish decisions and untidy circumstances. Often we won’t know what we’re getting into until we’re mired in that mud as well. Serving isn’t easy and it isn’t neat. We’ll deal with death and divorce, disease and distasteful duties. The people we’ll serve won’t always be “nice” or even appreciative. We’ll get dirty… but Jesus was willing to get dirty for us … are we willing to continue His work and get dirty for others? These are only a sampling of the behaviors people in retail jobs encounter every day. It made me stop and think about all the people who serve us in different ways. Somebody delivers my newspaper every day; somebody stocks the grocery store shelves, rings up and bags my purchases; somebody checks out my books at the library, somebody services my car and somebody cuts my hair. My life would be much harder and less pleasant if many people weren’t willing to serve. Yes, they are being paid, but that does not excuse me from being courteous and appreciative of all that they do. This month we’ve talked about how we’re all called to be servants — why not be servants to those who serve us? Kindness and respect can brighten another person’s day, and so today I challenge you think about and thank all those servants in your life! I met the author of this book, Linda Wood Rondeau at the local senior center where she spoke to a small group of people interested in writing. She told us her story of leaving her job as a social worker in her 50’s and launching a writing career. She has now published a number of novels. At the end of her presentation she allowed several of us to pick one of her books to take home. I chose A Father’s Prayer because she said it dealt with an autistic boy; I have two autistic nephews, so I was drawn to that topic. This short novel falls into the genre of Christian romance; frankly, not my cup of tea. However, it may be yours. It’s an easy read, predictable and formulaic. The heroine, Alexis, returns home after the death of her parents to raise her adopted autistic brother, Gib. Well-known country singer, Ethan Jacobs arrives on the scene to perform at a benefit for Gib’s school and takes a special interest in Gib. 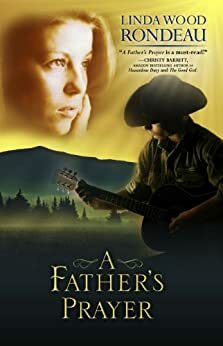 I won’t say more to prevent this review from becoming a “spoiler.” What follows includes romance, and the neat wrapping up of various problems encountered by Alexis and Gib, all presented within a Christian framework. She serves God through her writing, speaking engagements, and mentoring other writers. If you are interested in writing, or need a speaker for an event, she would be a great resource for you. We’ve talked about Mary this month, who was indeed God’s servant, but today I thought it would be appropriate to mention Joseph. His sacrifice for God was also great. No doubt he endured some disapproval and/or ridicule for marrying an already pregnant girl. Later, after another God-sent dream, he flees with the family to Egypt, abandoning his home, friends and livelihood. He does all this without complaint or questioning. He doesn’t hesitate or procrastinate. In fact, He never speaks! The Bible does not include a single word spoken by Joseph. What we do have is a record of his action — obedience. God knew the kind of man He wanted to raise His son; a man who understood servanthood and could model it for Jesus as He grew up. It is humbling to realize how far I fall short of this ideal. Often I obey, but in a slow and grudging manner. I whine about my circumstances and wish for an easier life. I don’t usually want to suffer or sacrifice, even if it’s for the good of others, even if it seems to be God’s will. If I’m honest, I’ll have to admit that I’m more like Jonah than Joseph. So today, of all days, amidst the gifts and the feast, the visiting and rejoicing, I need to take time to meditate on the lives of Joseph and Mary, God’s faithful servants. The people who raised Jesus, the God-man who lived and died as a servant to all of us. I’ll remember what truly pleases God. God doesn’t want us to be “good” people; He wants us to be His people. Dear readers, I wish you a Merry and Blessed Christmas. Go in peace; serve the Lord.